O’Toole Building of St. Vincent’s Hospital, originally headquarters of the National Maritime Union. 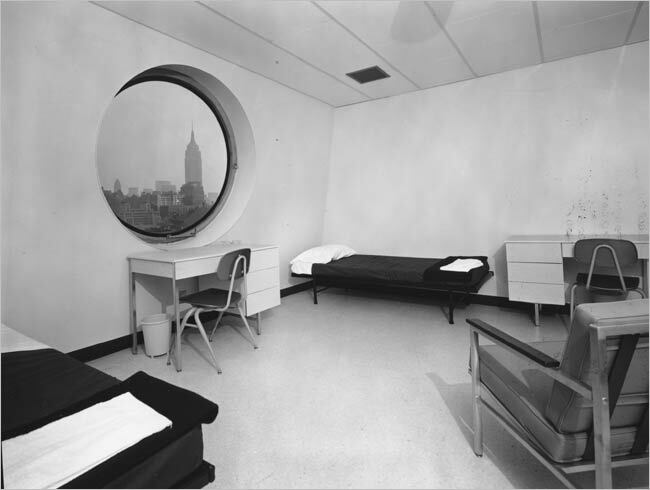 THE New Orleans architect Albert C. Ledner’s three offbeat creations for the National Maritime Union came ashore in New York in the 1960s, their porthole facades impudent in the face of doctrinaire modernism. The union sold off all three buildings within two decades. 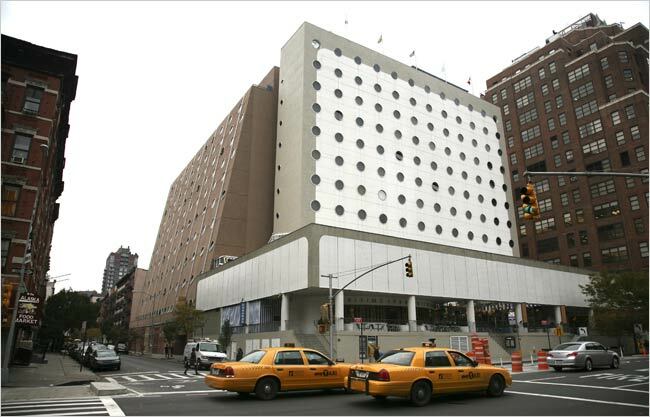 One of the pair on Ninth Avenue and West 17th Street is now the Maritime Hotel; the other, too, may soon morph into a hotel. But the fate of the third building — owned by St. Vincent’s Hospital at Seventh Avenue and 12th Street — is uncertain. The hospital wants to replace it with a high-rise, despite pleas from the preservation group Docomomo and despite the facade’s status as a landmark. In the 1950s, the National Maritime Union, running at flank speed on the seas of the mid-American century, began an ambitious program to build hiring halls, residences and training centers for its members. The union hired Mr. Ledner, then just a few years out of Tulane University. 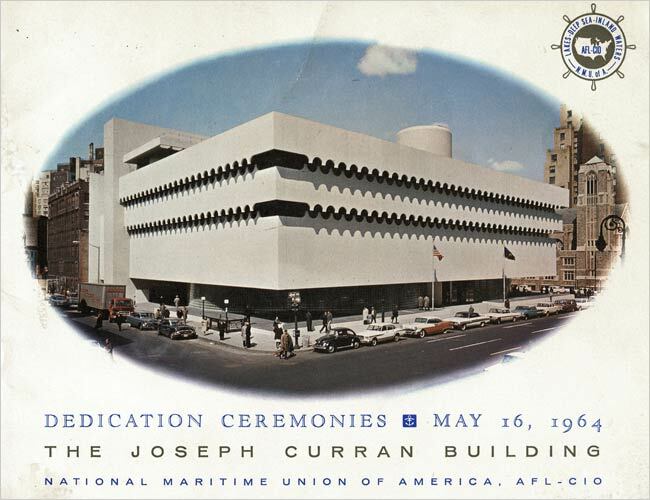 In 1958, when the port of New York still had plenty of jobs, the Maritime Union announced construction of a new headquarters to be designed by Mr. Ledner, on Seventh Avenue from 12th to 13th Streets. Completed in 1964, the six-story structure rests on two glass block cylinders — the hiring halls — with the walls above rendered as scalloped overhangs, with porthole symbolism. Two years later, the union finished an annex, at 346 West 17th Street, Ledner’s most dramatic work. Its 11 stories are dotted with over 100 portholes and slope back 20 feet from the base. When completed, the white tile facade burst out from its low-rise tenement surroundings like a storm wave over the bow. A few years afterward, Mr. Ledner devised a flanking wing for the annex, running from 17th down to 16th Street on the east side of Ninth Avenue. He gave it portholes, too, but rendered it in a shape like a thick pizza box on end, stark and rectangular. Even in the permissive ’60s, the implicit humor of this unorthodox trio transgressed mightily against the dead-serious modernism of the period. For the architectural elite, a nautically themed hiring hall for rough-and-tumble seamen was not much more than Disneyland. But just as the Maritime Union was completing its building campaign, the port of New York was collapsing, at least from the workers’ point of view. In 1973, the union sold the Seventh Avenue building to St. Vincent’s Hospital, diagonally across the street, and St. Vincent’s has used it as the O’Toole Building. The two buildings at 17th Street and Ninth Avenue were largely empty in 1987, when Covenant House acquired them for its programs for runaway youths. Now, St. Vincent’s has announced the sale of its complex on the east side of Seventh Avenue, from 11th to 12th Streets. It wants to use the money to replace the O’Toole Building with a new hospital, perhaps 21 stories high. But the building is included in the Greenwich Village Historic District; for the project to go ahead, the Landmarks Preservation Commission must signal that the O’Toole Building, mentioned very favorably in the commission’s original designation report, is disposable. It does lack the brilliant clarity of the West 17th Street structure. But it is nearly intact. Docomomo members have posted a brief on Ledner’s building at docomomo-us.org/files/. Over on 17th Street and Ninth Avenue, Mr. Ledner’s legacy is more seriously compromised. The pizza box building was converted to the Maritime Hotel several years ago. Today, it has a spruced-up facade, but there is retail space built out onto the open plaza, which originally defined the stark rectangular form. In the 1990s, the slope-sided annex structure suffered a humorless alteration that almost succeeded in eliminating its kicky maritime flavor: the dramatic intersection of the sloped facade with the sidewalk was covered over with fake storefronts. That structure is now owned by 346 West 17th Street L.L.C., which has filed plans to convert it, too, to hotel use. An executive of the company, Eran Nornberg, said his group was simply exploring its options. Even if the owners proceed, they may well decide that this town isn’t big enough for two porthole hotels and proceed with the theme of the alteration job started in the 1990s. In September, Albert Ledner came to New York to participate in a Docomomo seminar on his work. He was aghast at the fake storefronts on the 17th Street building, but thought the Maritime Hotel’s build-out on the plaza was intelligently done. The large five-story building of the National Maritime Union of America is a striking contemporary structure. Erected in 1962-63 from plans by Arthur A. Schiller and Albert Ledner, it serves both as National Headquarters and as its Port of New York office. The main portion of this building fronting on the Avenue is a glistening white, built above two curving glass-block walls. It has two overhangs at the top floors which are dramatized by their scalloped edge profiles. These overhangs produce an interesting play of light and shade. The rectangularized pattern of the stone veneer lends a new dimension to the building, making us double aware of the various wall planes. Bubble shaped covers of plexiglas serve to display ship models around the base, outside the glass block walls. Last edited by ManhattanKnight; November 24th, 2007 at 10:28 AM. Doesn't matter what the Commission says. You'd think that there would be a wide variety of building types in New York, but there really are not that wide and array. These buildings, like 2 Columbus Circle, will be overlooked and a period of rather unique building designs will be lost. Just as a side note, it still irks me to no end that the NY Pavilion in Flushing Meadow Park (from the 1964 World's Fair) is a ruin. ^ Few would want to recognize it, but the Twin Towers were also examples of this brand of filigree modernism --along with all of Yamasaki's work. Are we going to be left with his Princeton builing as the sole exemplar? Perhaps Gillespie sums it up best when he positions Yamasaki at the juncture between the fading of the International Style and the emergence of post-modernism. Yamasaki was looking for a way out of the modernist strictures, laid down by Le Corbusier, which formed his architectural education. Looking to Japanese, Arabic, Indian and even Renaissance and Gothic architecture for inspiration, he tried to balance a concern for the human experience of the building with his modernist principles and an interest in how a building's form reflects the cultural values and aspirations of the society in which it exists. In the end, it seems that his scale always tipped too far in one direction or another. His work is often dismissed as decorative modernism -- modernist buildings decked out in superfluous, ornamental filigree -- but in this move towards a more expressive, sensitive architecture, Yamasaki's work foreshadowed the histrionic, acrobatic gestures of post-modernism. Ha! I thought I'd invented the term. You did ^ you own it. Your search - "filigree modernism" - did not match any documents.